This amazing tool is a complete Bible reference library in one book! Build strong faith in a world of temptation with The Children's Ministry Resource Bible. Teacher training aids introduce you to the background on key Scriptures as well as important early childhood education priciples. 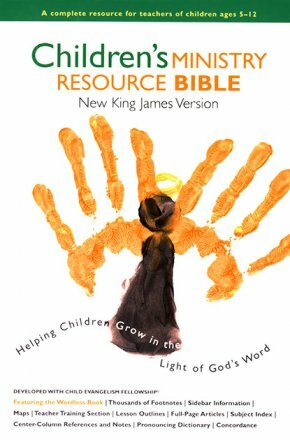 Articles on teaching techniques, child training and selected Bible topics add depth to your knowledge and teach you the way children learn best. A built-in Wordless Book section featuring colored pages and instructions keeps an effective Gospel tool at your fingertips. Footnotes, center-column notes and cross-references guide your research. Study helps and easy-to-follow symbols right on the page lead you through your lesson development. A generous reference section including a pronunciation dictionary, color maps, subject index and a concordance helps you make your lessons come alive!